Situated right in the heart of rural Gloucestershire, this stunning eighteenth-century mansion is surrounded by a 100-acre estate within easy striking distance of Stow on the Wold. The hotel has been given a thorough contemporary facelift by its current owners and is now a favoured destination for weekend breaks, celebrations and corporate events - with spa packages for good measure. The panelled restaurant and airy conservatory both have fine views of the grounds and they provide a suitable setting for food with a modern accent. Menus change each month to take account of the market and the seasons, but you might begin with - say - gratinated crayfish ravioli with lobster sauce or a winter salad of wood pigeon breast with wild mushrooms. Main courses could involve grilled monkfish with celeriac mousseline, flat parsley coulis and vegetable pearls or roast fillet of beef with duck foie gras, William potatoes and black truffle sauce, while meals end impressively with desserts such as exotic fruit Pavlova with Pina Colada ice cream or pistachio and strawberry macaroons with lime and lemon parfait. 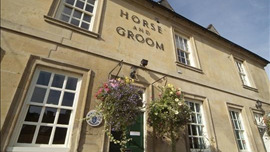 The delightful, honey-coloured Horse and Groom is perched on a hill not far from the A44 in the lovely village of Bourton on the Hill.